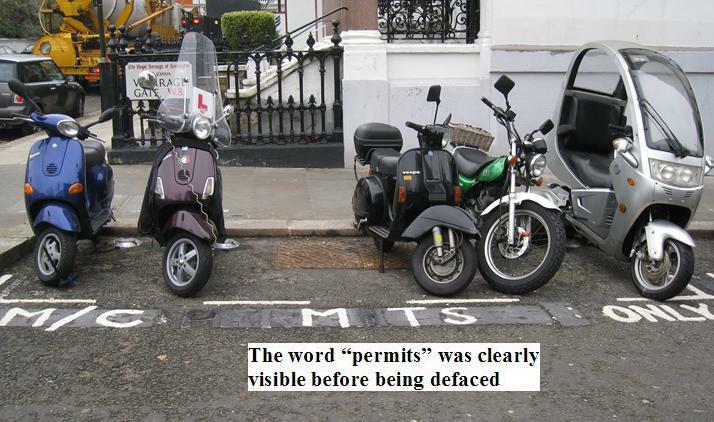 Earlier this month, we published a post to report how the motorcycle parking bays specifically dedicated to residents in the Royal Borough of Kensington & Chelsea (RBKC) were having a little taste of the medicine that continues to be administered to Westminster City Council by some unknown citizens, to force the Council to scrap their highly unpopular motorcycle parking tax. A large number of bike bays in Westminster continue to be “upgraded” by having their signs defaced or stolen by a group of unknown citizens, in order to make the local parking tax unenforceable and therefore maintain free parking throughout the borough. It appears that a large number of motorcyclists continue to be very unhappy with the RBKC’s parking policy, which includes the provision of 960 spaces in bike bays for resident use only, subject to purchasing and displaying a parking permit. While the RBKC continues to provide free motorcycle parking for visitors, resident bays are constantly empty thus forcing all motorcyclists (residents and visitors) to park their motorbikes and scooters like sardines, in the remaining 1,368 free spaces available in visitor bays. If you’re a visitor to the RBKC, it is now almost impossible to quickly find a space to park close to your destination because residents (and we don’t blame them) refuse to pay for parking in the bays dedicated to them. 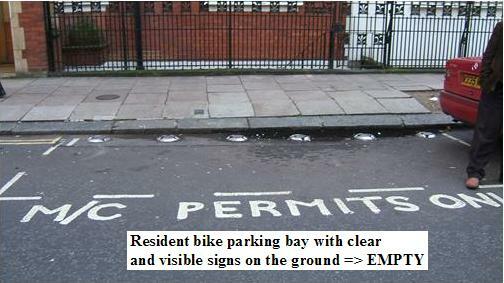 We have recently been made aware of an increasing number of defaced residents bike parking bays in Kensington & Chelsea, where the signs painted on the ground to advise motorcyclists of the requirement to purchase a resident parking permit to use those bays are covered in thick black paint, making them useable by everyone free of charge. We had never seen so many bikes parked in a bay that is normally for residents use only! Below is what a resident bike parking bay normally looks like in the RBKC, i.e. it is completely empty. We wonder how many letters and emails of complaints the RBKC has received over the past 18 months with regards to their stupid motorcycle parking policy, which makes a substantial amount of kerb space totally unused, due to 960 resident spaces being constantly left empty. This is very poor kerb space management, but like their Tory colleagues in Westminster, the RBKC Councillors also seem to ignore the public and pretend to know better than everyone else. Wouldn’t one think that because motorcyclists use the services on a daily basis, they are therefore better placed to provide some constructive feedback to the Council? We wouldn’t even like to think of how much the RBKC has spent on the purchase and installation of 960 security devices in resident bays, all this for absolutely nothing and being a complete waste of taxpayers’ money. In the meantime, when you see a defaced bike parking bay in Kensington & Chelsea (as shown on the above photo), you should be able to park your motorcycle in it free of charge (although at your own risk), as no one can be expected to guess who is allowed to park in there when the signs are not entirely and clearly visible. Should you decide to park your bike in a defaced resident bay, you should take a picture of the bay as a proof that it is defaced, in case you need to challenge a potentially invalid PCN. While UK France Bikers.com does not condone any activity that could be considered as vandalism, we can only assume that the continued “upgrading” of the residents bike parking bays is a clear indication that something is seriously wrong and we would expect the RBKC to thouroughly re-think their motorcycle parking strategy at their earliest opportunity. It’s always a very bad idea to treat motorcyclists like cash cows, isn’t it? let’s do a’ go slow’ rideout!! If you want to park in the residents only bike bays you can just pay £35 a year..Thats OK if you want to leave the bike there all week and ride it only on the weekend, but if you want to pop out to say; Peter Jones to do a bit of shopping you are fooked because a lot of residents work for Peter Jones and park in the residents only bays,,thats OK you can park in the free bays ,,NO they are full up with “out of borough” Peter Jones workers. So to be able to park anywhere in a shopping area in the borough you are forced to pay the £80 to park in the car bays. And have you noticed that the majority of bike bays [both residents and free] have been placed under trees, there’s nothing better than come out in the morning to ride to work only to find your bike covered wit bird poo, that’s ok too you just have to pop back indoors and get a bucket of water and wash the poo off…so if any members of the council want a lift to work on my scooter just bring some bottles of water with you.